Austin, TX, April 28, 2016— The University of St. Augustine for Health Sciences (USAHS) is proud to announce that 43 graduates from the university’s Austin campus were presented with degrees at the spring commencement ceremony on Friday, April 15. USAHS is a leading graduate institution that emphasizes rehabilitative and health science education through innovative classroom education. The graduates were joined by family and friends as they received a Doctor of Physical Therapy degree. 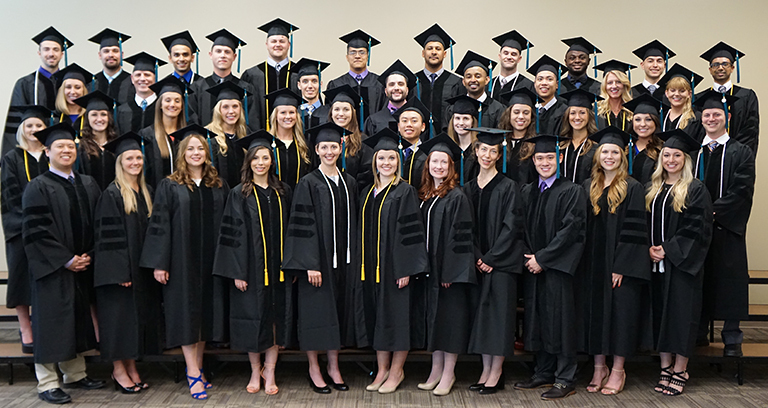 The University of St. Augustine for Health Sciences Austin, Texas campus celebrated its spring commencement by presenting 43 graduates with Doctor of Physical Therapy degrees. The Patricia King Scholastic Achievement Award is presented to the entry-level physical therapy graduate who has achieved the highest cumulative grade point average (GPA). Grades from both foundational science courses and professional courses are included in the cumulative grade point computation. The 2016 Patricia King Scholastic Achievement Award was presented to Alyson K. Smith from Bridge City, TX. The Stanley V. Paris and Catherine E. Patla Award for Excellence in Manual Therapy is presented in recognition of excellence in spinal and extremity manual therapy in professional physical therapy education to an entry-level physical therapy graduate. The 2016 Stanley V. Paris and Catherine E. Patla Award for Excellence in Manual Therapy was presented to Alyson K. Smith from Bridge City, TX. The Outstanding Physical Therapy Student Award is presented to an entry-level physical therapy graduate who possesses characteristics most supportive of the program’s mission statement. These attributes include professionalism, clinical reasoning, ethical standards, and commitment to professional growth. The 2016 Outstanding Physical Therapy Student Award was presented to Jamie L. Krefting from Springfield, OH. Across each of the USAHS campuses in Florida, Texas and California, nearly 200 physical therapy, occupational therapy and Doctor of Education students from 25 states and three countries graduated. For more information or to view photos from the ceremony, visit the USAHS Facebook page at www.facebook.com/universityofstaugustine.